What? Why did I stick my head out of the car window? Maybe I was trying to share a view with a family pet? You know how dogs like to stick their heads, and even their tongues out, it seems fun! Or maybe something smelled so bad in the car that I was dying for some fresh air? Let me finish the recipe here. Ingredients (for 5 to 6 plates)? But we shall not be daunted by it! Mix well and let it sit in the fridge for at least 4 hours, preferably overnight. Drain out the excess liquid and it'll be ready for cooking. Bring a big pot of water to a boil, toss in dried glass noodles and cook according to the package instruction. Meanwhile, have a big pan ready, drizzle some oil and turn to high heat. Toss in sliced onions and sprinkle some salt. Cook till the onions turned slightly translucent, add the scallions and garlic, give it a quick stir. About couple minutes, it's time to add the seasonings. Mix well with the ingredients and let it cook for few minutes to the flavor soaked into the veggies. Give it a taste, see if more seasonings are needed. Mix well with the sauce, serve with toasted sesame seeds. This recipe also applies to other type of noodles such as egg noodles, ramen, even spaghetti. Please enjoy! I gonna go play some music while the base drums are still banging in my head. right now i'm eating pancakes for the 100 time. not korean influenced at all... anyway keep up the good work. Yeah of course you should start blogging again! The last entry you wrote, there should be a 2nd part coming up right? I've been waiting for months!! MONTHS!!! Get writing! 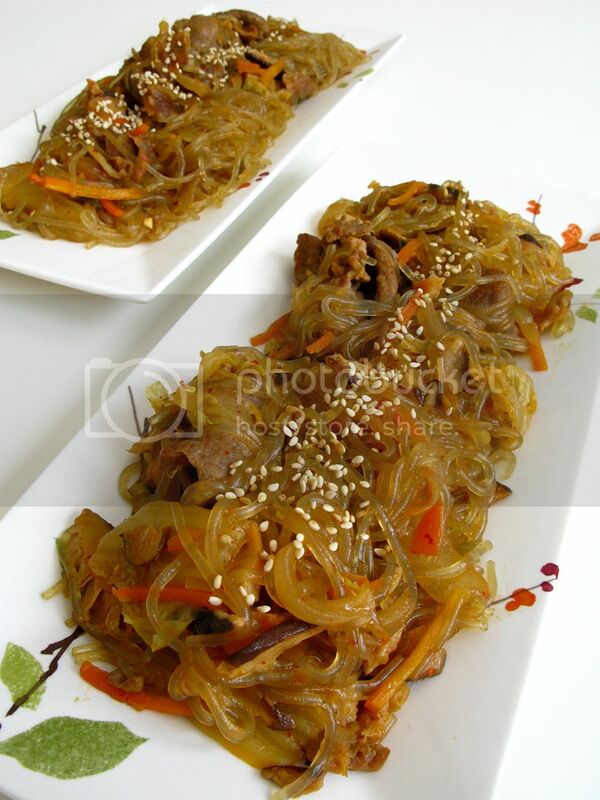 I find your version of the Jap Chae much more appealing than the original. Your recipe tastes a bit lighter. keep it up the good work! Thanks for the comment! It always encourages me when someone left a comment for me. By the way, I love your name! This looks fantastic. I will put this on my list of things to try. Thanks for sharing! Thank you so much, let me know how it goes!! Hope you'll love the recipe! How do I subscribe by email to your blog posts? I think there's a icon on the bottom on my homepage where you can subscribe it! Thanks for your interest! By the way, your name is "mom getaway" or "mom get away??" **Just wanna clarify~!